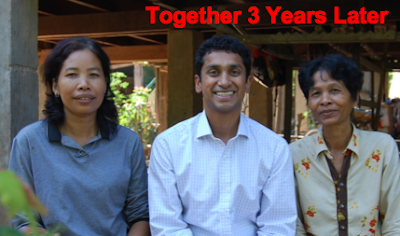 In the last few weeks, we’ve blogged about Cambodia, its thriving microfinance industry, and featured a specific Kiva Field Partner. Last month, I had a chance to actually visit Cambodia. As my colleague Cissy De Luca noted, the trip allowed me to better understand the incredible ecosystem of people and institutions on the ground that Kiva's lenders, staff and volunteers support each day. 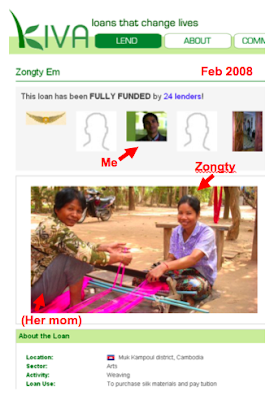 Like most borrowers listed on Kiva, her loan was 100% funded and several months later was successfully repaid back. But after 3 years, I was curious to hear in her own words what kind of impact, if any, the loan had on her family's life? Zongty lives on Koh Dach island located in the Mekong River near the capital city of Phnom Pehn. Days earlier, I had read an excellent blog post by Kiva Fellow Lina Goldberg about the island's silk weaving history. Silk weaving was a craft passed down from grandmother to mother, mother to daughter for generations on the island. Indeed, Zongty's Kiva profile indicated that she had learned the craft from her mother (also pictured above). Now this tradition and income source were threatened by the increasing price of imported raw silk and decreasing price of finished silk textiles in the market. Although the island was only 15 kilometers away, getting there took nearly 2 hours by car and ferry from the headquarters of MAXIMA, the Kiva Field Partner that administered Zongty's loan. I was accompanied by Pa Siry, a talented manager at MAXIMA who served as my interpreter and guide. Shortly after Pa Siry, our interpreter, explained the purpose of my visit to Zongty, I showed her a paper print-out of her Kiva profile. I love doing this when meeting Kiva borrowers. I've found time and again that one can break through language, culture and literacy barriers by focusing the initial conversation around a Kiva profile. There's seemingly a universal curiosity and enjoyment of seeing one's own photo, the photos of Kiva lenders, the recognizable logo of their microfinance institution and the world map with a Google 'pinpoint' over their country. The print out served as a great visual tool to help explain the connection between Zongty and myself. Before asking Zongty about her weaving business and life, I offered a little about myself. I told her about my family, where I lived and how I earned a living. While she asked me questions, her mother came out to greet me and join our conversation. Life was a bit tighter economically for Zongty since 2008. A big factor was indeed the changing economics of silk weaving. For example, in 2000, 2 kg of raw silk cost $58 compared to $100 today. With rising raw silk costs and falling finished silk prices, Zongty decided to switch to weaving nylon. So each day, she produces a 3 x 1.2 meter nylon piece on her loom. This earns $3 in the market. Subtracting out $1.75 in raw nylon material cost, Zongty's daily take home profit is $1.25. It's a lot of work for a very little amount of money. To compound matters, Zongty described how the rising cost of food -- which has been a major problem in the last few years for the working poor worldwide -- has made making ends meet tougher. Her husband helps by working construction jobs when available, growing sugar cane and bananas, and fishing in a local pond for food. Together, they estimate earning $3 a day. That said, she proudly told me about her children and their prospects for a better life. Zongty has two daughters. The $1,000 loan helped pay for their oldest daughter's university degree in tourism. She now works at a resort, earning significantly more than she would as a weaver. Zongty then described how her younger daughter wanted to be like her older sister -- and she has enrolled in college and is studying accounting! Zongty, who did not have a chance to complete primary school, was radiant when she talked about her daughters, and it was evident how proud she was of them. For me, it made clear the value of the micro-loans we help fund on Kiva. It helps low-income households capitalize on an opportunity by being able to exchange small affordable payments for a large lump sum of cash. In this case, covering their daughter's education no doubt allows for a huge jump in earning potential between a struggling silk weaving trade and formal employment in the services sector.